- Sorry, I'm not good at English. Add an item from the "+" button in the upper right corner of the list page. 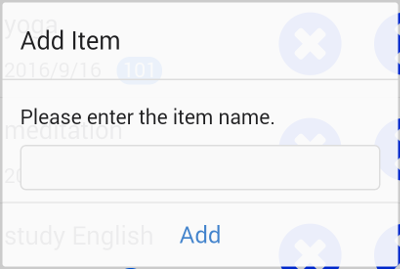 This time, will add a new item to a group (Category-1/2) of currently selected. Drag the rectangular plaid of the items left edge, you can sort in the screen. When you tap the check mark, check mark is rotated, displays a notes in the notes field. Hold the notes field when the check mark is rotating, you can enter a note. Daily Note is consists of the following three pages. This section describes the function of earh page. Check items are divided into two groups (Category-1 / Category-2) can be managed. There is no functional difference in the group. It displays the addition check item dialog. When you press the Set button to enter the item name, and then add a new item to the group of the currently selected. - The same name of the item can not be created. In addition, can not create even a group are different. - If the item name is long, it is omitted in the middle(dependent on the terminal). It displays the official site of the manual (in this section). Please try to slow operation if this does not work. It displays a delete confirmation dialog. 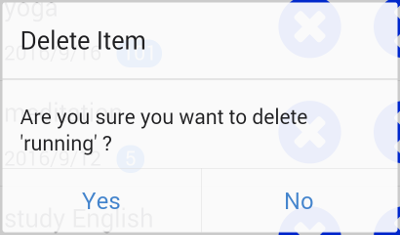 When you press the Yes button, remove the item. It display check page corresponding to the ccheck item. As you add items, hidden items to more items at the bottom of the screen. At this time, the display portion of the item name (between the delete button and drag&drop area) up and down, you can swipe to scroll through the list. 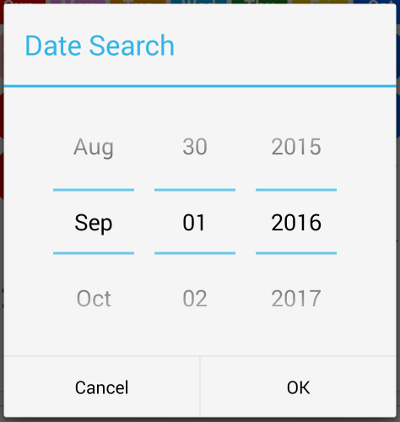 It displays the date search dialog. Specified day is not required. Return to current date, and displays. It will be displayed in bold. 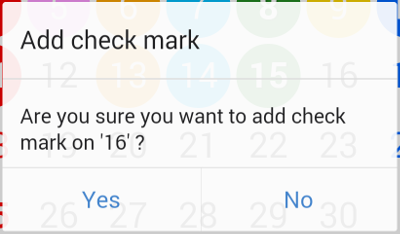 When you tap the date, it will be added to the check mark. When you hold the date, It will display additional confirmation dialog. If you select "Yes", add a check mark. For the month in the display, you can not check on the day of the last month and the next month. You can not check the dates of the future than current date. 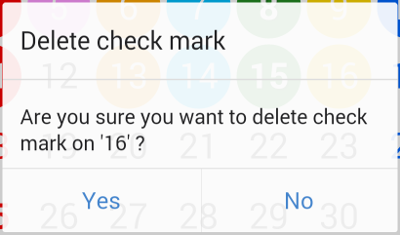 When you hold the check mark, it will display delete confirmation dialog. If you select "Yes", delete a check mark. 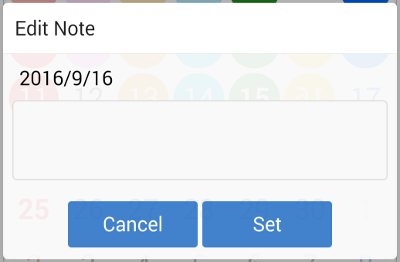 Hold the notes field when the check mark is rotating, it will display edit note dialog. Enter the note and press the "Set" button, the note will be saved. Note has been set date will be in bold white. 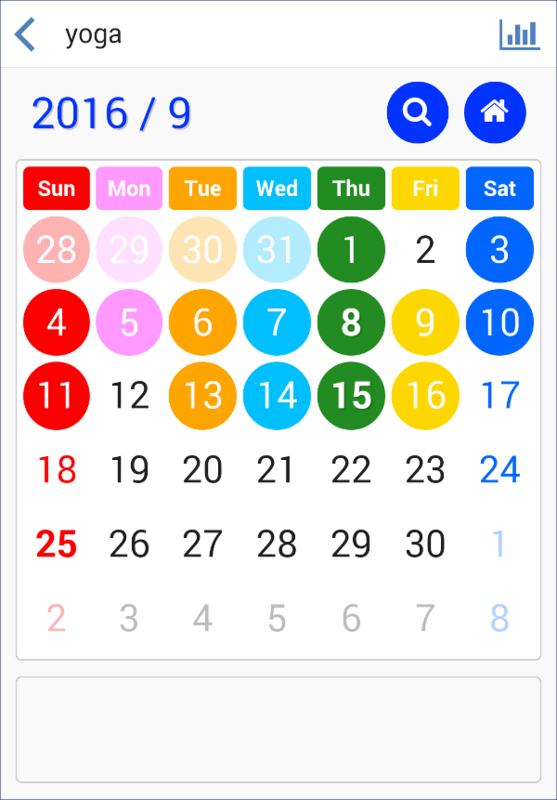 For the current date, even if they have not been set, it will be displayed in bold. 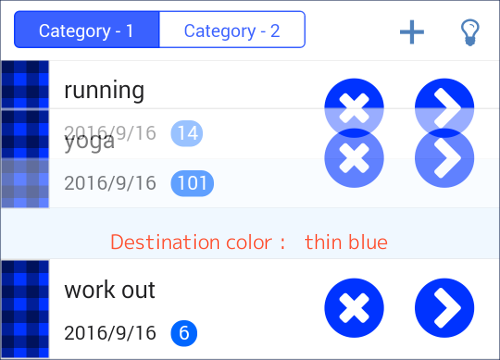 Rotational state is canceled with change the month of the calendar, and add/delete the check mark, move page. 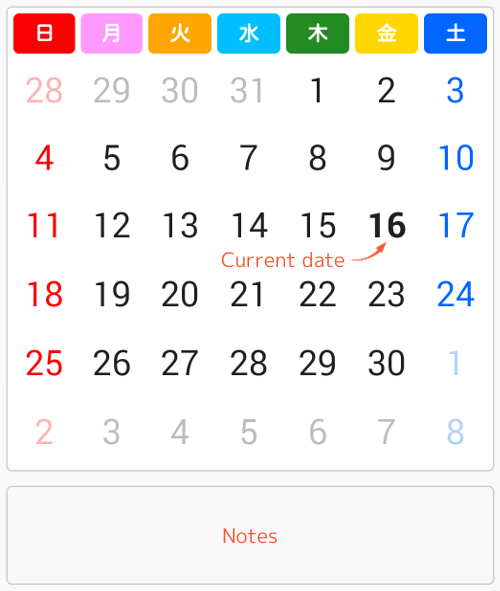 Even if you want to enter immediately Note after you check current date, hold the note field from in the rotating state. It represents a check of the start date and the last day. 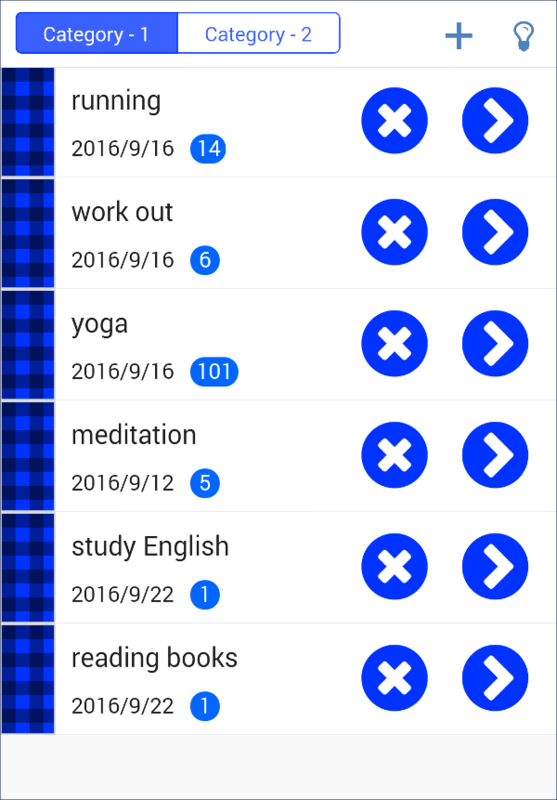 the total number of check marks. 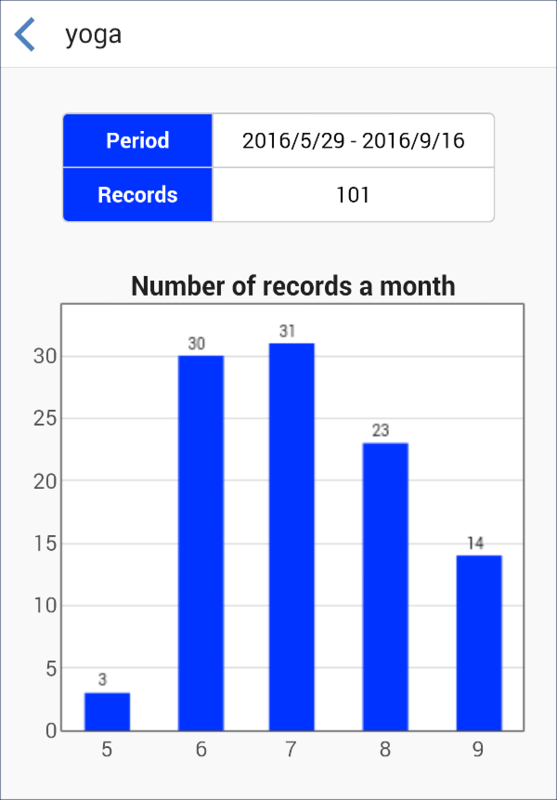 t represents the total of the number of records per month.